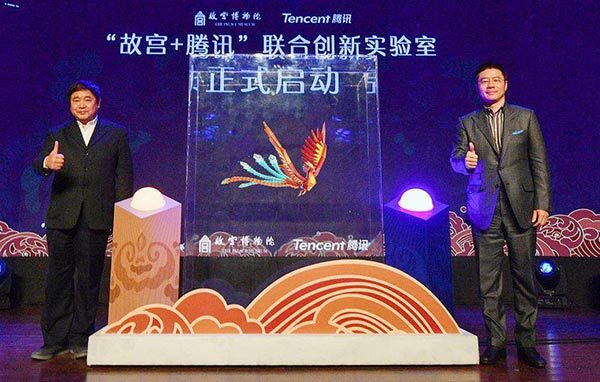 The Palace Museum, aka the Forbidden City, joined hands with Chinese internet giant Tencent to establish a "creative laboratory" in Beijing on Wednesday. The lab will enhance the two sides' collaboration in adapting new technologies to the research, conservation and display of cultural heritage. Tencent will apply such technologies as big-data analysis, artificial intelligence and cloud computing to offer more operational solutions to the Palace Museum, which hosts over 1.86 million relics. The two sides began cooperation last year when Tencent launched a competition called "Next Idea" for young designers to develop games, emojis and other cultural products inspired by the Forbidden City. The lab announcement came at the end of a two-day forum on the fusion of new technology and traditional culture co-hosted by the museum and the internet company. "The best way to perpetuate tradition is to bring it into young people's daily lives," Tencent's vice-president Cheng Wu says. The company has undertaken several projects to revitalize traditional culture in recent years. These include cooperating with UNESCO to adapt traditional folk games from all over the world into computer games and featuring endangered folk music in its music database.